Accounts Receivable depreciate in value. Everyone knows that the older an account gets, the harder it is to collect. What they may not realize is the extent that their money is evaporating from accounts that have not yet been collected. 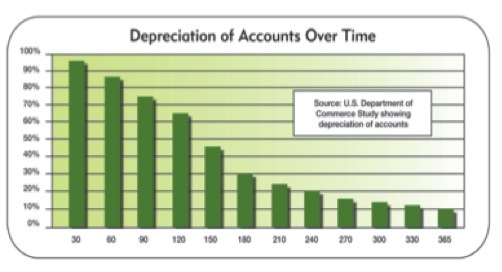 According to the US Commerce Department study indicated by the graph below, accounts over 90 days depreciate at a rate of .5% every day that they are not collected. By the time an account reaches 180 days, the threshhold at which most businesses and medical practices throw up their hands and assign the account to a collection agency, 70% of the value of the account will never be recovered by anyone. They have already spent considerable time and money in chasing the account in-house. That time and money is gone, as is the collectibility of the account. But, there is a better way. According to the Dartnell Institute of Business, the average cost of collecting a slow-pay account in-house is $31.60 each. Using an outsourcing partner to do it not only gets the account collected sooner, before it depreciates, but can generally save the business a majority of their cost to do it as well. Relationships with customers/patients can be retained, cash flow increased, and staff has more time to do productive things, rather than chasing the patients for money. I ca show you in a 22 minute A/R strategy session by phone if the tools that I use can help your business. Respond to me via the form below and we can make an appointment to talk briefly. Isn’t it worth a 22 minute investment to see how much your cash flow can improve?